Who needs DisneyWorld when you've got a showdown on translations? By the looks of it, yesterday's Orlando debate and vote on the proposed revision of the Proper of Seasons packed even more of a punch than expected. [O]nly seven bishops out of 250 Latin Rite prelates in the United States even bothered to propose amendments to the text, a clear sign that most felt the handwriting was on the wall. Like it or not, many concluded, Rome has made clear that the new translations must be closer to the Latin, both in structure and word choice, thus producing a more “sacral” language sometimes remote from ordinary English usage. All that changed this morning, however, when Bishop Victor Galeone of Saint Augustine, Florida, rose to oppose the proposed text -- despite, he said, fear that doing so may be "in vain." A former Latin teacher who still reads Thomas Aquinas in the original language, Galeone made a forceful argument that the new translation is simply too unclear and awkward to be effectively used in American parishes. “The last time I heard that word was back in 1949, during Stations of the Cross in Lent,” Galeone said. “A good translator has to understand not just the original language, but also one’s own into which these texts are being put,” Galeone said. Despite assurances to the contrary, he said, the new texts are “slavish” with respect to the Latin originals. “I’m an obedient son of the church, and if these texts are passed as they stand, I will pray with them,” Galeone said. “But I feel that the vernacular has been a blessing to our people.” Galeone added that with “all due respect” to the recent ruling from Pope Benedict XVI authorizing wider celebration of the old Latin Mass, he hasn’t celebrated the old rite since 1970. If he were asked to do so today, he said, he would instead celebrate the new rite of the Mass in Latin. Galeone’s speech seemed to open the floodgates, as other bishops rose to voice reservations about the new translations. Sklba warned that if the proposed text were adopted, “our priests and our people” will press the bishops to come back to it “again and again” to remedy perceived defects. “This is not yet mature,” he said. Bishop Donald Trautman of Erie, Pennsylvania, a longtime critic of the new translations, said the texts contain a number of “archaic and obscure” terms, pointing to words such as “wrought,” “ineffable,” and “gibbet.” He also said that the text’s preference for mimicking the sentence structure of Latin, featuring long sentences with a large number of dependent clauses, impedes understanding in English. Trautman cited one prayer in the new Proper of Seasons presented as a single 12-line sentence with three separate clauses. Bishop Robert Lynch of Saint Petersburg, Florida, thanked Galeone for giving him the “courage for this moment.” Lynch then told the bishops that he had recently taken the new Mass texts back to his presbyteral council, composed of 26 priests. Two were in favor of the translation, he said, and 24 were opposed. Other bishops, however, argued that aditted imperfections in the text don’t justify further delays in the process. Archbishop John Vlazny of Portland made another argument in favor of the text, noting that four other English-speaking bishops’ conferences have already approved it. If the Americans reject it, he said, it could jeopardize the goal of a common text. Bishop Arthur Seratelli of Paterson, New Jersey, chair of the U.S. bishops’ Committee for Divine Worship, defended the texts. After all that the bishops were unable to reach a decision, largely because of the electoral math. The rules of the conference require that the text be approved by two-thirds of its members, not just those physically present. 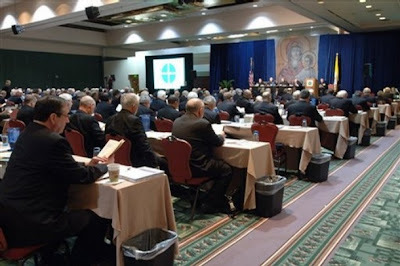 Since there are 250 Latin Rite bishops in the United States, 166 “yes” votes are required to approve it, while 83 “no” votes are necessary to reject it. As it turns out, the Orlando meeting was sparsely attended – one headcount yesterday found just 178 voting members. As a result, this morning’s ballot failed to get enough “yes” votes to approve the text, or enough “no” votes to block it. As a result, Cardinal Francis George of Chicago, president of the conference, announced that bishops who were not present will receive ballots in the mail in order to settle things one way or the other.